As an example, Italy has been accepted for energy and climate needs as being generally similar to many other states, not being considered as a northern or southern state, and therefore representing an average. The residential and tertiary sector accounts for about 40% of the total thermal energy used; from this it is clear that intervening in the energy efficiency of buildings is the obligatory way to go. From this need arose the assignment to put all the country’s building legacy under examination for a specific energy class, based on the annual primary energy requirement that is needed to heat every square meter of floor area measured in KWh / m2. year. The Interministerial Decree of June 26, 2015, entitled “Adjustment of national guidelines for the energy certification of buildings,” approves the National Guidelines for the Energy Certification of Buildings (APE 2015), which will replace those currently in force (see Annex. 1 to Ministerial Decree 26/06/2015). c) The creation of a common information system for the entire national territory for the management of a national land registry for energy performance certificates and thermal plants. Annex 1 to the above decree defines the new national guidelines for the preparation of the EPA, namely certification of the Energy Performance of buildings. Summer performance of the envelope (high, medium, low, depending on the values assumed by the summer periodic thermal transmittance). Winter heating: Gas fueled furnaces (natural gas) in compliance with the requirements of Table 8 of Appendix A to Annex 1 of the DM minimum requirements and with relative efficiency utilizing any of the subsystems referred to in Table 7 of the same Appendix. Summer air conditioning: Electric motor vapor compression cooling machine in compliance with the requirements of Table 8 of Appendix A to Annex 1 of the DM minimum requirements and with relative efficiency utilizing any of the subsystems referred to in Table 7 of the same Appendix. Ventilation: Single flow mechanical ventilation for extraction in compliance with the requirements of Table 9 of Appendix A to Annex 1 of the Ministerial Decree. Domestic hot water: Gas fueled heater (natural gas) in compliance with the requirements of Table 8 of Appendix A to Annex 1 of the DM minimum requirements and with relative efficiency utilizing any of the subsystems referred to in Table 7 of the same Appendix. Lighting: Compliance with the requirements of paragraph 1.2.2 of Appendix A to Annex 1 of the DM minimum requirements. Transportation of people or things: Compliance with the requirements of the DM minimum requirements. A low Energy Performance Index (for example, less than 0.40) corresponds to low energy consumption and therefore better energy performance. 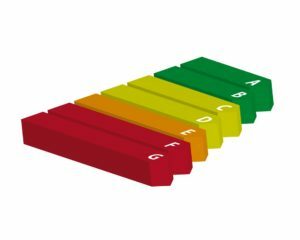 The Energy Performance Index is one of the most significant parameters in determining the commercial value of a building. A class A apartment, in fact, has a much higher sales value than one in class G or F (even 25% – 30%) as it is less energy-consuming and as a result the higher price paid for the purchase is amortized with a reduction in energy consumption which translates into economic savings of the so-called running cost. From January 1, 2012, in the event of a transfer offer only for the consideration of buildings (excluding transfers by gift and between family members) or individual housing units, commercial sales announcements must state the Energy Performance Index (EPgl) ) contained in the APE Energy Certification Certificate. This obligation derives from art. 13 of the Legislative Decree March 3, 2011, n. 28 which made changes to the Legislative Decree of August 19, 2005, n. 192. The adoption of the Spring system in new buildings and renovations, both in the civil and service sector (offices, schools, hospitals, etc. ), entails a significant economic saving in the management of the heating service of the building legacy. All the savings indicated in economic terms translate into lower emissions of greenhouse gases; therefore, the use of the “SPRING” system contributes considerably to the achievement of the objectives of international climate protection agreements. Finally, it should be borne in mind that when using the Spring system in place of the above mentioned systems, in addition to savings in economic management, the property’s energy class is improved, thus increasing its commercial value.